Why Jammu city ranked so low in the ‘Ease of Living Index 2018'? Why Jammu city ranked so low in the ‘Ease of Living Index 2018′? Jammu City stood 95th among 111 cities across India in the Ease of Living Index announced by the Union Ministry of Housing and Urban Affairs recently. The implementation of the assessment commenced formally on January 19, 2018 covering 111 cities. The Ease of Living Index is an initiative of the Ministry of Housing and Urban Affairs to help cities assess their live bility vis-à-vis global and national benchmarks and encourage cities to move towards an outcome-based approach to urban planning and management. 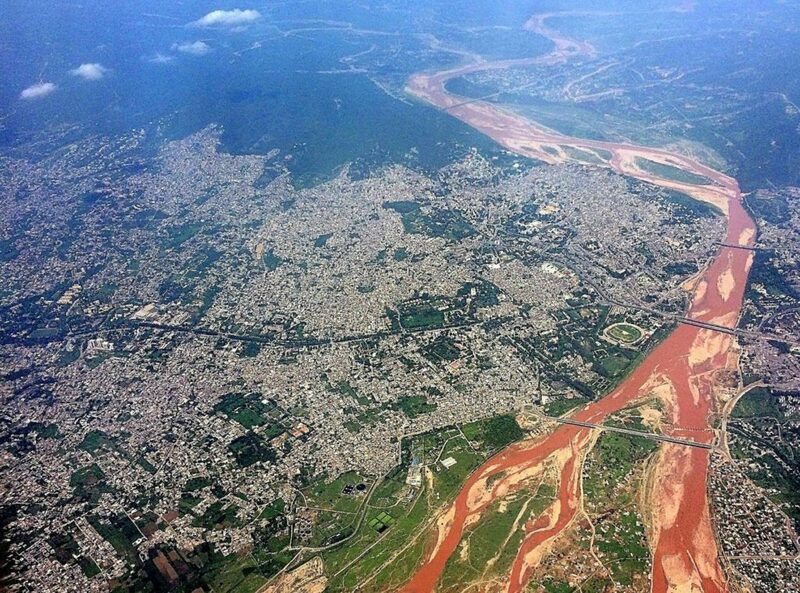 An aerial view of the Tawi river crossing Jammu town. Also seen are three bridges over the river. The brownish color of the water is due to the upper belt of Tawi river is full of loose soil and it’s washed down whenever it rains heavily, thus the color. The city that found place in the Smart City Mission of the Centre has either drawn blank or scored below one on key fronts such as solid waste management, waste water management assured water supply, public open spaces and mixed land use and compactness. The Ease of Living framework comprises four pillars, namely Institutional, Social, Economic and Physical which have been further broken down into 15 categories and 78 indicators. Evaluation of cities has been done on a 100-point scale across the 78 indicators with the Institutional and Social pillars carrying 25 points each, 5 points for the pillar on Economic and 45 points for the Physical pillar. Jammu City with a geographical area of 112 square km and 5.76 lakh population has scored only 25.71points, which include 3.39 for Governance, 1.66 for Identity and Culture, 3 for Education, 2.06 for Health, 3.2 for Safety and Security, 1.04 for Economy and Employment, 0.98 for Housing and Inclusiveness, 1.5 for Public Open Spaces, 1.92 for Mixed Land Use and Compactness, 0.69 for Power Supply, 0 for Transportation and Mobility, 1.83 for Assured Water Supply, 1.0 for Waste Water Management, 1.18 for Solid Waste Management and 2.26 for Reduced Pollution. Jammu has scored 3.39 points in Institutional, 9.92 in Social, 1.04 in Economic and 11.36 in Physical pillars. The result of Ease of Living Index together with the recent outcome of Swachh Survekshan 2018 is definitely wake up call for local leadership as well as bureaucracy. If these two categories of stakeholders do not rise to the occasion, the Dogra city of Jammu & Kashmir will continue to lag behind despite having all potential to grow. Every effort should also be made by the state to increase the efficient delivery of health, sanitation, transportation & Mobility, assured water supply, Identity & Culture and Governance through higher investments in these areas.